Last time we noticed that it would be great to have navigation options for app users so they can return to the previously viewed application page. As our example application is quite simple, adding HTML markup for navigation is a straight forward process. Ratchet (the front end framework we are using for this project) has back button styles already built in. We just have to add a link element above the title of navigation bar to TheatersControllerView.html. Adding it below would create right side navigation bar button. The back route we add is to the root view as there is only way app user can navigate to TheatersControllerView. Other views in our app don’t need to have navigation back option. 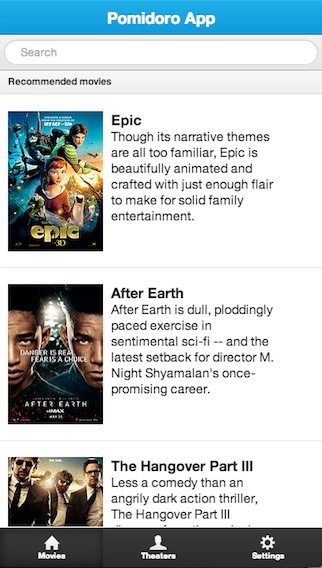 Now after testing the project code in Safari browser we can see a nice navigation effect after the particular movie from the list is clicked by user. This animation transitions us to the theaters controller and view. After testing on mobile devices I noticed that sliding effect is a little bit slow and has small lag as well. How to smooth it up is not the goal of this tutorial and most likely I’ll cover this subject in the separate post here on HTML Center. 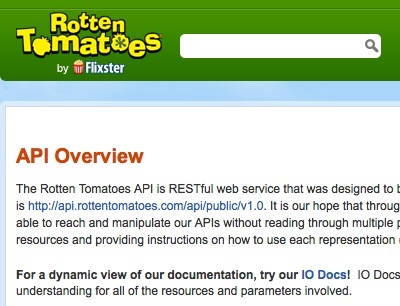 Next chapter is about adding web services communication functionality to consume Rotten Tomatoes API data and display it in our app. For performing HTTP requests AngularJS has a property named $http (nice and simple naming). It also has strong support for promises. Promises (if you are not so much familiar with them) is a concept we use while dealing with async communication requests. Then we perform request and assign result of that request to some variable but do not expect it to have complete response right away. Because communication with 3rd party web service takes time. Therefore promise variables are guaranteed to have response data some time in the future. It is a good information security practice not to store your sensitive developer credentials data in app itself. As all applications are running on devices which you have completely no control off. Always try to perform communication with 3rd party API’s via back end code and keep mobile application as a simple client. You will notice at the beginning of the file I have code to enable cross domain access for Ajax requests. You can limit this to specific origin, domain etc. // with 3rd party web services. In the above code I’m making use of ready variable which is being set in controller and will be set to yes once all requested movie data is available. Until then I’m going to display "Receiving data..." text in the list item element. ng-show is the directive making this all happen as I only have to supply ng-show="!ready" and AngularJS knows to hide it once variable is being set to true. Now once project files are updated, reloading the page will give us the following result. By no means its a finished mobile application but it has a good foundations and MVC framework to build on to. But it has scroll view, dynamically loading content from external web services, animated transitions and is powered by AngularJS. As we were working in the directory called www migrating this project to wraper like PhoneGap and make it installable app is quite easy. You just have to replace contents of the www directory in your PhoneGap XCode project with the ones you created during this tutorial. If you want to understand how to create PhoneGap powered XCode application we have good tutorial for your here at HTML Center. I hope you have enjoyed this tutorial, final source code for example application can be found hosted on the GitHub. As always I welcome all the comments, suggestions and advice. Hey. This is quite useful and informative article. instead of printing only Hello Singapore. hey, looks like your server is not running php or is not executing php index files. get in touch with your hosting provider.